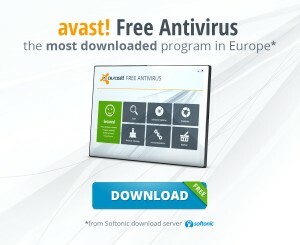 Softonic, one of the world’s largest download site for Windows, Mac and mobile, has just announced that avast! Free Antivirus is the most popular download in Europe. Thank you to our users who have downloaded AVAST from Softonic! Very good protection for a FREE product. It is very user friendly and the automatic updates were very nice to have. It is the only Free antivirus software I've tried, so I can't compare it to other free software, but I really liked it. PROS: One of the lightest antivirus I have ever seen. Protection is also better than many other paid_Antiviruses. It ate only 9 MB of ram in my PC. "VB 100" or "AV Comparatives" already certified it for its solid security. Can be customized easily according to needs. Streaming fast updates. User friendly and attractive interface. Auto Sandbox facility. Cons: Doesn't come with a firewall. Full scan is a little bit slow. Excellent, thank you avast! you've made my internet usage far more enjoyable. I no longer get annoying viruses on my computer and I was able to get rid of the ones that I had but didn't even know. Read Softonic's Software Trends (PDF) report to learn more about popular downloads and trends.